I built a trailer to pull behind my Honda Golding. I used a harbor Freight red trailer with 12you inch white wheels. I was happy with how the box turned out for the trailer and the wheels that came with the trailer looked ok. When I installed the new wheels from this site, my wife said that the trailer now looked like a factory built trailer rather than a home built. Love the wheels. Totally changed the look of the trailer. These wheels look great,installed them on a escapade motorcycle trailer can't believe what a difference it makes.highly recommend these wheels. I wanted some new rims for my Escapade trailer. The old ones were a bit rusty. I asked my girlfriend which rim she liked and she picked out the sawtooth. A good choice I think. I bought these wheels to replace the old style chrome spokes with spinners on my 96 California Sidecar Colorado SPort motorcycle trailer. These modern wheels make the trailer look like I bought it yesterday!!! HUGE improvement Lightning fast shipping great price and they came mounted and balance ready to install!!! really enjoying my new wheels, get complemented on them everywhere I go. people wanting to know where I found them like that for small trailers and pop up campers. However the sleeves to go over the buddy barings were hit and miss on the sizing one fit the whell perfect, while the other one went in past the chamfer on the back of the wheel. I was able to modify it and make it work, other than that I love them. Tow-Behind motorcycle trailer ///Look Great. Awesome purchase. 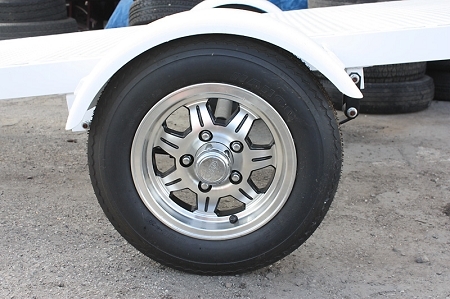 Very cool looking trailer wheels that put the "finishing touch" on my trailer. 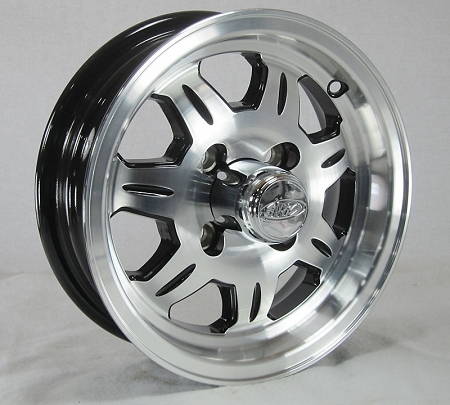 Bought these wheels to put on my trailer that I pull behind my Harley. Really dresses the trailer up. Construction is great and the finish is flawless and delivery was faster than I expected. I would highly recommend these wheels AND trailerwheels.com. Received them very quickly put them on right away. They look great! What can i say, its a nice looking rim and looks great on my newly wraped trailer for my DJ business. The wheels look great. Delivery was prompt and the wheels were packaged to prevent damage and sctatches during shipping. They also are a match to my 2011 Harley Triglide rear wheels.